We got upgraded so had a whole little apartment to ourselves which was perfect for our short stay. Great location, had all the facilities we needed and was a nice and cosy shelter from the cold weather! This place was rated 9/10 and that's probably the most wrong rating I've ever seen. 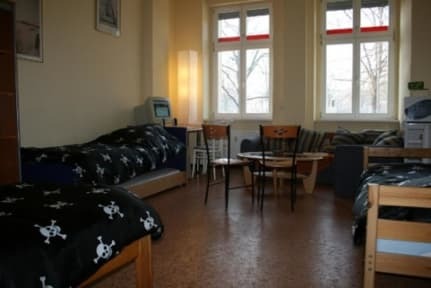 First of all: I would not call this place a hostel, it's more like a bad mix between a hotel and an airbnb-place. There is no common room, no reception and no atmosphere whatsoever. 2: The location is maybe acceptable, you need to walk 15 minutes to come to a nice area. 3. Overall, the place looks old and boring, would not recommend this for young people or travellers. 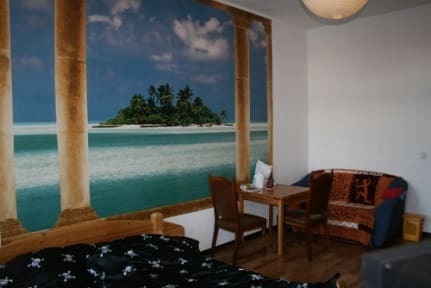 Unfortunately pirate hostel tried to be something that wasn't quite there. We stayed in the private double room, which had a big bathroom with mold growing off the shower-head. The bathroom sink was considered the 'kitchen sink'. The 'kitchen' consisted of a coffee machine but no mugs. A stove with with fry pans, yet no sharp knives (blunt knives to cut carrots = tough times) Be careful of your belongings too. Value for money however was fine.